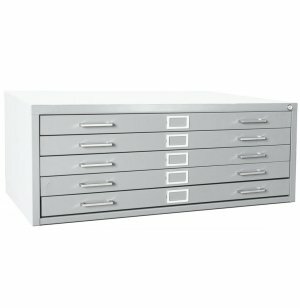 Flat file cabinets are ideal for architecture and art applications. Their large drawers keep papers stored in the horizontal position so they won’t fall out of place or get crumpled. 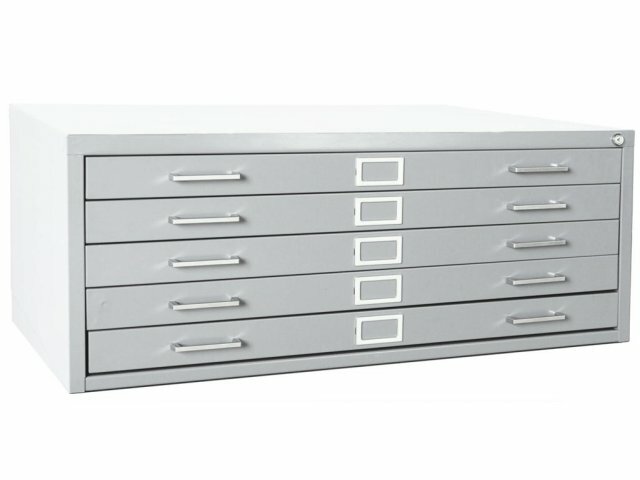 These heavy-duty welded steel file cabinets will provide long lasting durability to keep your valuable drawings, artwork, maps, and other flat materials neatly and safely stored. It includes hinged paper weights in drawer fronts and hoods at rear to prevent papers from curling. When your documents are stowed away in a flat filing cabinet, you can be sure to find them just how you left them, even after many years. User-friendly features make this flat file cabinet an excellent choice for daily office use. Drawers slide smoothly on ball-bearing rollers for trouble-free operation and courtesy stops prevent them from rolling while in the open position. These stackable units can be used individually or pile high to fill your whole file room. Secure Filing: A central-locking system prevents unauthorized parties from accessing documents. Easy Opening: Extra-strength drawer rails provide proper alignment for smooth operation as courtesy stops keep drawers in the desired position. No Curling: Dual hinged depressors hold drawer contents down so papers will not curl while in storage. Versatile: The durable 1.875"-deep drawers are perfect for either archival or active storage. Convenient Design: Stackable units mean you can always add more drawers without having to replace old ones or rearrange.